Add antique traveler style to your everyday life with the Brass Oil Lamp Keychain. 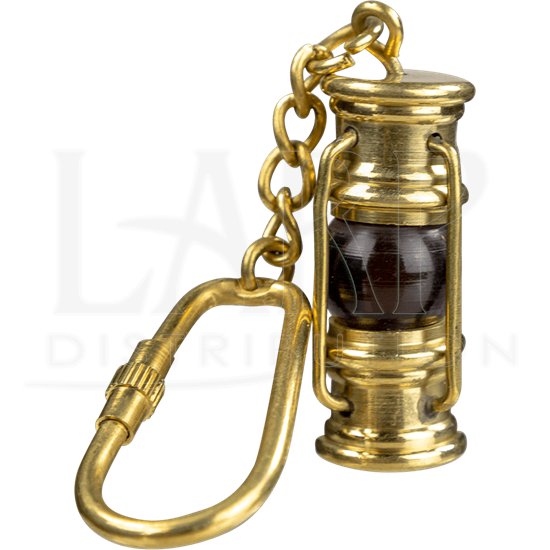 This historically-inspired keychain is handcrafted from brass and has a darkened glass center, replicating in miniature the look of an antique lamp. The top and bottom are flat, and bars extend between the two to hold the center piece secure. A short brass chain is attached to the top, connecting the mini oil lamp charm to a knurled knob ring. This fastener style makes it easy to add keys or attach the keyring to a bag or zipper pull. It also provides secure closure. Bring a historical, nautical style everywhere you go with this detailed mini lantern keychain.